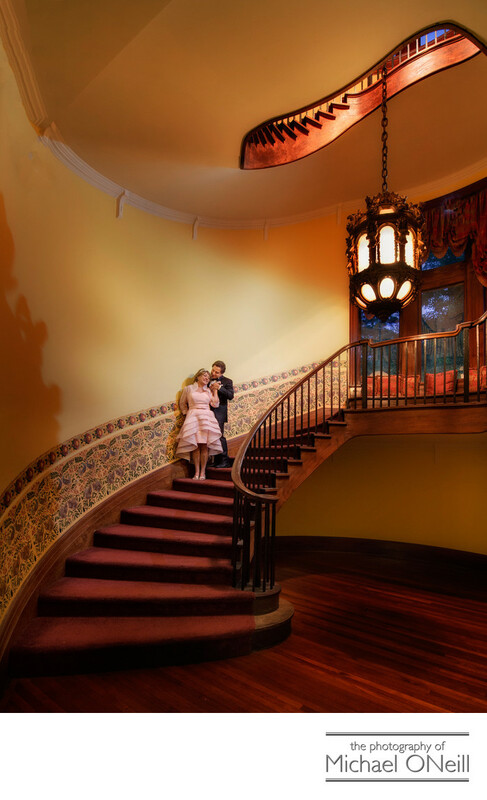 This picture was taken on the majestic circular staircase located inside Coindre Hall in Huntington, NY. This venue is one of the many Gold Coast mansions of Long Island, New York. I love working in all of these establishments as the classic architecture lends itself so well to elegant wedding photos. As you peruse this web site you will find dozens of images created in the finest Long Island mansions such as Oheka Castle, The Royalton at Roslyn Country Club, deSeversky Mansion, The Glen Cove Mansion, The Vanderbilt Mansion, The Bourne Mansion, Mill Neck Manor and others. Coindre hall may be one of the best venues to host an intimate wedding reception. The stunning view from the dining room looks out across the great lawn as it leads down to Huntington Harbor and the Long Island Sound beyond. The courtyard garden is the perfect spot for the reveal...the first look...as well as for portraits of the bride and groom. Fireplaces are located in nearly every room. A spacious bridal suite is located upstairs and a grand piano sits in the main lobby. Then there’s the stairway you see pictured here. This beautiful structure rises three stories and makes for amazing wedding photographs from many different angles and viewpoints. To top it all off Coindre Hall is located just minutes from my East Northport, LI photography studio and gallery.